Viscount Torrington. Ds. Harrington, Sec. Sir Edward Bellew against Tennison & al. Vernon against Huysh & al. And likewise, the joint and several Answer of Francis Huysh Clerk, and Ephraim Thwaites and Anne his Wife, Three of the Respondents to the Appeal of Jane Vernon Widow. Ld. Berkeley takes his Seat. John Lord Berkeley of Stratton sat first in Parliament, after the Death of his Father William Lord Berkeley of Stratton; his Lordship having, at the Table, taken the Oaths, and made and subscribed the Declaration, and also taken and subscribed the Oath of Abjuration, pursuant to the Statutes. Burdet to attend, about the Persian Trade Bill. Ordered, That Thomas Burdet do attend this House, immediately, in order to be examined as a Witness upon the Bill for opening a Trade to and from Persia through Russia. Against Schemes in America, Bill. With a Bill, intituled, "An Act for restraining and preventing several unwarrantable Schemes and Undertakings in His Majesty's Colonies and Plantations in America;" to which they desire the Concurrence of this House. 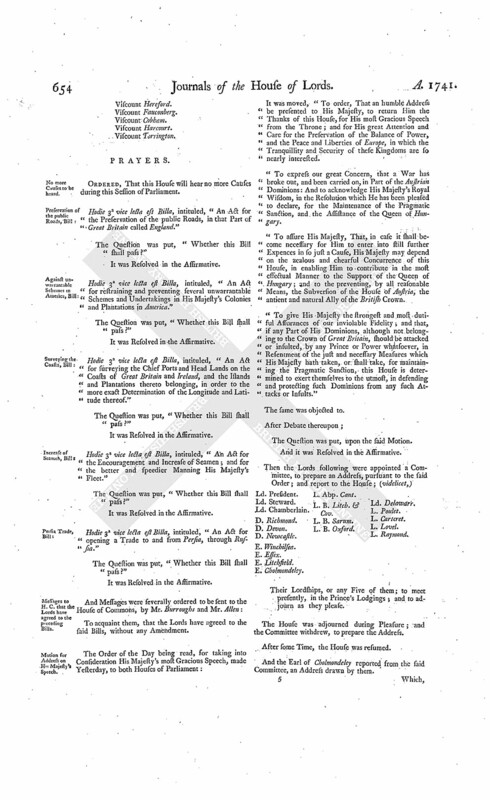 Upon reading the Petition and Appeal of Mary Dalrymple, formerly Mary Gainer, lawful Wife of Captain James Dalrymple, of the Regiment of Foot commanded by the Earl of Rothes, and of Helen, Elizabeth, Mary, and Jean Dalrymple, their lawful Children; complaining of several Interlocutors of the Commissaries of Edinburgh, of the 2d of December last, 2d of January, and 9th of March following; as also of certain Interlocutors of the Lords of Session in Scotland, of the 20th and 27th of February last, made on the Behalf of Captain James Dalrymple; and praying, That the said Interlocutors may be reversed; and that the Appellants may have such other Relief granted them as (fn. 1) the House in their great Wisdom shall think just:"
It is Ordered, That the said Captain Dalrymple may have a Copy of the said Appeal; and he is hereby required to put in his Answer thereunto, in Writing, on or before Thursday the 30th Day of this Instant April; and that Service of this Order upon his Agent, or any of his Procurators before the said Commissaries in Scotland, be deemed good Service. Yorkshire Cloth, Manufacture regulating, Bill. Hodie 2a vice lecta est Billa, intituled, "An Act for continuing an Act passed in the Seventh Year of the Reign of His present Majesty, to explain and amend a former Act, passed in the Eleventh Year of the Reign of His late Majesty King George the First, for the better regulating the Manufacture of Cloth, in the West Riding of the County of York; and for making the said Acts more effectual." Vis. Torrington. L. Bp. St. Davids. "Copy of the Treaty of Navigation and Commerce between His Majesty and Her Czarish Majesty, concluded at Petersburg, 2d December 1734; and Translation." Ordered, That the said Treaty and Translation do lie on the Table. Hodie 2a vice lecta est Billa, intituled, "An Act for the Encouragement and Increase of Seamen; and for the better and speedier manning His Majesty's Fleet." Hodie 3a vice lecta est Billa, intituled, "An Act for enabling the Right Honourable Charles Earl of Arran to raise Money, by Sale or Mortgage of Part of his Estate in the Kingdom of Ireland, for Payment of Debts, and for other Purposes." Hodie 3a vice lecta est Billa, intituled, "An Act to supply some Defects in the Laws for repairing, and rebuilding County Bridges; for repairing, enlarging, erecting, and providing, Houses of Correction; and for passing Rogues and Vagabonds." Extracts of Treaties, &c. between Great Britain and other Powers, delivered. "Extract of the Treaty between Great Britain, France, and Spain, concluded at Madrid, Jane 13th, 1721." And also, "Extract of the Treaty concluded between Great Britain, France, and Spain, 9th November, 1729." Ordered, That the said Extracts do lie on the Table. "Extracts of Treaties between Great Britain and other Powers; with a List thereof." "Copy of the 28th Article of the Barrier Treaty, concluded at Antwerp, 15th November 1715; and Translation." "Copy of the 3d Article of the Treaty between Great Britain and Holland, concluded at Westm'r, 6th February 1715/16; and Translation." "Copy of the 2d, 3d, 4th, and 5th, Articles of the Treaty between the Emperor and Great Britain, signed at Westm'r, 25th May, 1716; and Translation." "Copy of the 5th and 6th Articles of the Treaty between Great Britain, France, and Holland, signed at The Hague, 4th January, N. S. 1717; and Translation." "Extract of the Treaty of Alliance, for restoring and settling the public Peace, concluded at London, 22d July 1718; Articles 3, 4, 5, 6, 7." "Extract of the Separate and Secret Articles, belonging to the Treaty of Alliance, for restoring and settling the public Peace, concluded at London 22d July, 1718; Article 11; and Translation." 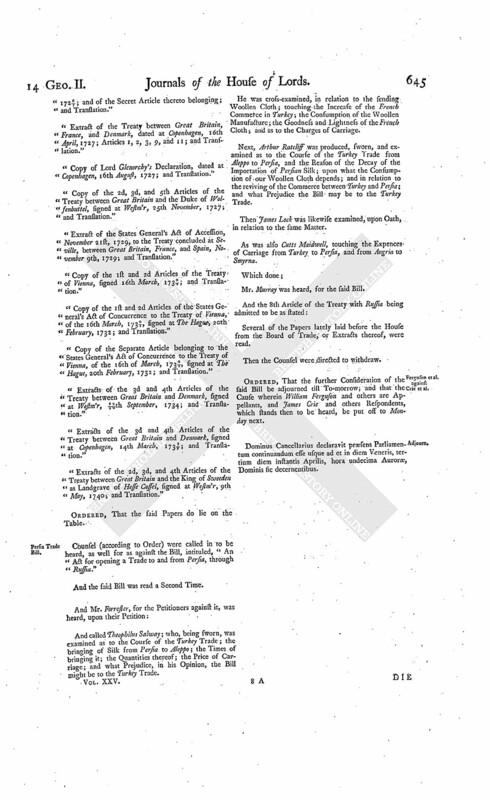 "Copy of Lord Polwarth's Act, for the Guaranty of the Dutchy of (fn. 2) Sleswick, dated at Frederichsbourg, 23d July, 1720; and Translation." "Extracts of the 2d and 3d Articles of the Treaty of Hanover, dated the 3d September, 1725; and Translation." "Extract of the Treaty between Great Britain and the Landgrave of Hesse Cassel, dated at Westm'r, 12th March, 1725/6; Articles 1, 3, and 7; and Translation." "Extract of the States General's Accession to the Treaty of Hanover, signed at The Hague, 9th August, 1726; and Translation." "Extract of the King of Sweden's Accession to the Treaty of Hanover, signed at Stockholm, 14th March, 1726/7; and of the Secret Article thereto belonging; and Translation." "Extract of the Treaty between Great Britain, France, and Denmark, dated at Copenhagen, 16th April, 1727; Articles 1, 2, 3, 9, and 11; and Translation." "Copy of Lord Glenorchy's Declaration, dated at Copenhagen, 16th August, 1727; and Translation." "Copy of the 2d, 3d, and 5th Articles of the Treaty between Great Britain and the Duke of Wolsenbuttel, signed at Westm'r, 25th November, 1727; and Translation." "Extract of the States General's Act of Accession, November 21st, 1729, to the Treaty concluded at Seville, between Great Britain, France, and Spain, November 9th, 1729; and Translation." "Copy of the 1st and 2d Articles of the Treaty of Vienna, signed 16th March, 1730/1; and Translation." "Copy of the 1st and 2d Articles of the States General's Act of Concurrence to the Treaty of Vienna, of the 16th March, 1730/1;, signed at The Hague, 20th February, 1732; and Translation." "Copy of the Separate Article belonging to the States General's Act of Concurrence to the Treaty of Vienna, of the 16th of March, 1730/1;, signed at The Hague, 20th February, 1732; and Translation." "Extracts of the 3d and 4th Articles of the Treaty between Great Britain and Denmark, signed at Westm'r, 19/30th September, 1734; and Translation." "Extracts of the 3d and 4th Articles of the Treaty between Great Britain and Denmark, signed at Copenhagen, 14th March, 1738/9; and Translation." "Extracts of the 2d, 3d, and 4th Articles of the Treaty between Great Britain and the King of Sweeden as Landgrave of Hesse Cassel, signed at Westm'r, 9th May, 1740; and Translation." Counsel (according to Order) were called in to be heard, as well for as against the Bill, intituled, "An Act for opening a Trade to and from Persia, through Russia." And called Theophilus Salway; who, being sworn, was examined as to the Course of the Turkey Trade; the bringing of Silk from Persia to Aleppo; the Times of bringing it; the Quantities thereof; the Price of Carriage; and what Prejudice, in his Opinion, the Bill might be to the Turkey Trade. He was cross-examined, in relation to the sending Woollen Cloth; touching the Increase of the French Commerce in Turkey; the Consumption of the Woollen Manufacture; the Goodness and Lightness of the French Cloth; and as to the Charges of Carriage. Next, Arthur Ratcliff was produced, sworn, and examined as to the Course of the Turkey Trade from Aleppo to Persia, and the Reason of the Decay of the Importation of Persian Silk; upon what the Consumption of our Woollen Cloth depends; and in relation to the reviving of the Commerce between Turkey and Persia; and what Prejudice the Bill may be to the Turkey Trade. Then James Lock was likewise examined, upon Oath, in relation to the same Matter. As was also Cutts Maidwell, touching the Expences of Carriage from Turkey to Persia, and from Angria to Smyrna. Mr. Murray was heard, for the said Bill. Several of the Papers lately laid before the House from the Board of Trade, or Extracts thereof, were read. Ferguson et al. against Crie et al. Ordered, That the further Consideration of the said Bill be adjourned till To-morrow; and that the Cause wherein William Ferguson and others are Appellants, and James Crie and others Respondents, which stands then to be heard, be put off to Monday next. Dominus Cancellarius declaravit præsens Parliamentum continuandum esse usque ad et in diem Veneris, tertium diem instantis Aprilis, hora undecima Auroræ, Dominis sic decernentibus. Preservation of public Roads, Bill. With a Bill, intituled, "An Act for the Preservation of the public Roads, in that Part of Great Britain called England;" to which they desire the Concurrence of this House. 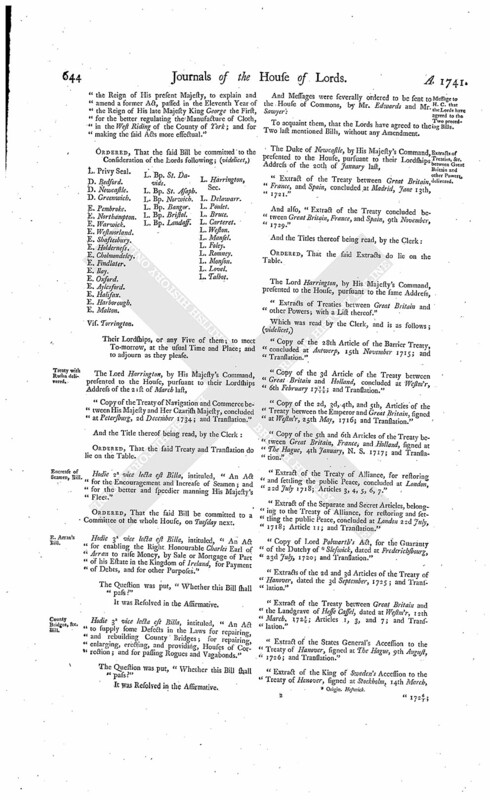 With a Bill, intituled, "An Act for surveying the chief Ports and Head Lands on the Coasts of Great Britain and Ireland, and the Islands and Plantations thereto belonging, in order to the more exact Determination of the Longitude and Latitude thereof;" to which they desire the Concurrence of this House. West Riding of Yorkshire Cloth Manufacture, Bill. The Earl of Carlisle reported from the Lords Committees to whom the Bill, intituled, "An Act for continuing an Act, passed in the Seventh Year of the Reign of His present Majesty, to explain and amend a former Act, passed in the Eleventh Year of the Reign of His late Majesty King George the First, for the better regulating the Manufacture of Cloth, in the West Riding of the County of York; and for making the said Acts more effectual," was committed: That they had considered the said Bill, and examined the Allegations thereof, which they found to be true; and that the Committee had gone through the Bill, and directed him to report the same to the House, without any Amendment." Thwaites et al. Petition for Liberty to appeal, referred to Committee. Upon reading the Petition of Ephraim Thwaites and Anne his Wife (who is the Heiress at Law), and of Francis Huish Clerk, the Devisee, of John Vernon Merchant, deceased; setting forth, "That, on the 25th of April 1740, this House gave Liberty to Jane Vernon Widow, upon her Petition, to exhibit an Appeal, from a Decree, or Order of Dismission, of the Court of Chancery in Ireland, made in the Year 1686, if she thought sit; which she accordingly did, the 3d of December last; and the Petitioners, with other Respondents, have put in their Answers thereunto; but the same is not set down for Hearing;" and praying, In regard the Rights and Claims of all Parties are proper to be heard and determined together, that the Petitioners may be also at Liberty to prefer their Appeal to this House, complaining of the said Decree or Order, and to redeem the mortgaged Premises in the Pleadings mentioned, and have Possession of such Part of the Estate in Question as is not comprehended in such Mortgage; and that their Lordships will be pleased to give such further Directions as to them shall seem meet; and that the Appeal of the said Jane Vernon may be adjourned over till the next Session of Parliament, in order that both Appeals may come on together:"
Count Leslie's Petition to Appeal, rejected. 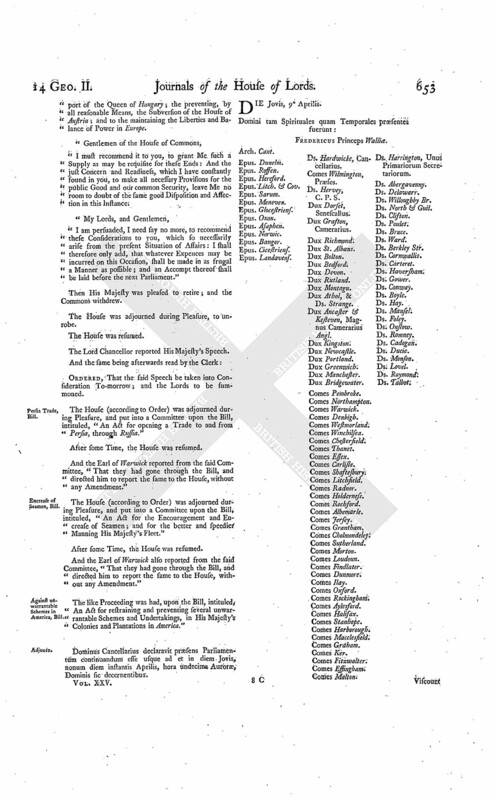 A Petition of Leopoldus Count Leslie, Eldest Son and Heir of Charles Cajetan Count Leslie, was presented to the House, and read; setting forth, "That he hath been advised to appeal from several Interlocutors of the Lords of Session in Scotland; but, before the same could be prepared, the Time limited by the Standing Order was elapsed;" and praying, "That his said Appeal may be now received. Relief of Debtors, &c. Bill. Hodie 2a vice lecta est Billa, intituled, "An Act to continue an Act for Relief of Debtors, with respect to the Imprisonment of their Persons; and Two subsequent Acts, for explaining and amending the same; and also to continue an Act for the free Importation of Cochineal and Indico." 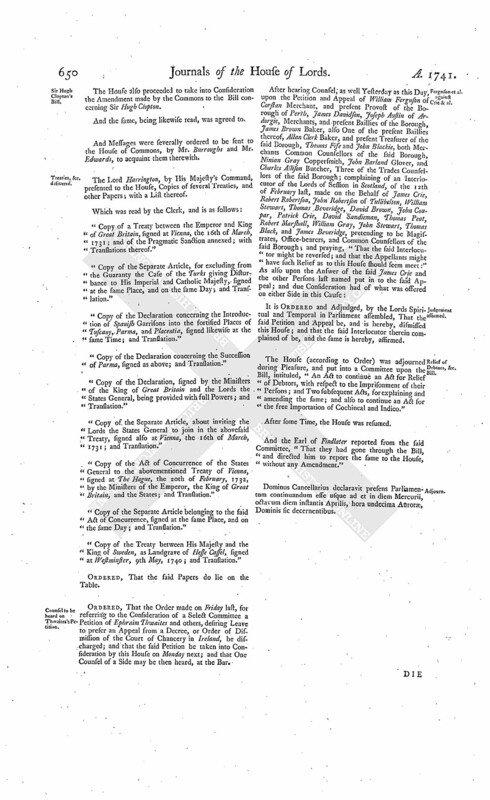 The Order of the Day being read, for the further Consideration of the Bill, intituled, "An Act for opening a Trade to and from Persia, through Russia." Counsel, as well for as against the said Bill, were called in. And the Counsel for the Bill called Charles Willmer; who, being sworn, was examined in relation to the Charge of the Carriage of a Bale of Cloth from England to Aleppo; and of a Bale of Silk from that Place to London. He was cross-examined, in relation to his making the said Computation. Next, Robert Nettleton was produced, sworn, and examined, as to the Charge of Carriage from London to Petersburg, and thence to Resched, and the Distance between those Places, and the Conveniency of the Carriage with respect to Land or Water. He was cross-examined, whether there would not be a Necessity of having a House at Resch'd; as to the Customs to be paid on the Frontiers of Persia; Charge of Consulage, if a Consul necessary; touching the Distance between other Places; the Method of the Carriage of Goods, and the Advance in Price of Hemp. Then George Napper was examined also, upon Oath, as to the sending of the Woollen Manufacture through Russia to Persia, and whether it would be sold to Advantage; as to the Dress of the Persians; touching his Engagements to export Cloth to Persia; what Place is the Metropolis of that Kingdom, and the Nature of the Cloth to be sent? Whereupon he produced divers Patterns of Cloth. He was further examined, with relation to the Usage of the Merchants; and as to his Opinion about Clothing the Russian Army; touching the Pay of both a Persian and Russian Soldier; what is brought back for the Cloth; the Difference of Profit to the Factor; as to any Application made by the Dutch to carry on this Trade; and whether the Armenians are not alarmed at the Prospect of it. He was cross-examined, in relation to Privileges obtained by the Armenians to trade; the bartering Cloth for Silk; touching the Place of Residence of the Sophi of Persia; the remitting of Taxes by him; the making of Presents; and as to the Plague in the Silk Provinces. Robert Crammond was likewise examined, upon Oath; as to the carrying Cloth to Russia, and so to Persia, by the Armenians, or by English Merchants, and the Nature of it; also in relation to the building a Ship at Kasan; and the State of the East India Trade with respect to Persia. He was cross examined, as to the Methods of the Persians getting Cloth; and touching the Consumption of the Woollen Manufacture. Then Thomas Burdet (who was ordered to attend) was produced, sworn, and examined, as to the Quantity of Silk imported by the Turkey Company, and of what Growth; the Uses to which Persian Silk can be applied; touching the Prices of Raw Silk, and the Difference of that Commodity. He was cross-examined, with relation to his Knowledge of the Quantity of Silk imported, the Cause of that Knowledge, and the Endeavours used to obtain it. Lastly, Robert Dingley was called, sworn, and examined, as to the vending of Silk; the providing Cloth for the Persian Market, and of what Sort; and touching the Ship building at Kasan. He was cross-examined, in relation to Silk brought into Russia manufactured; and touching any Application for Insurances from Petersburg to Resched. Then, the Examination being ended, the Counsel for the Petitioners against the Bill was heard, by Way of Reply. After which, the Counsel were directed to withdraw. Dominus Cancellarius declaravit præsens Parliamentum continuandum esse usque ad et in diem Lunæ, sextum diem instantis Aprilis, hora undecima Auroræ, Dominis sic decernentibus. Hodie 3a vice lecta est Billa, intituled, "An Act for continuing an Act passed in the Seventh Year of the Reign of His present Majesty, to explain and amend a former Act, passed in the Eleventh Year of the Reign of His late Majesty King George the First, for the better regulating the Manufacture of Cloth, in the West Riding of the County of York; and for making the said Acts more effectual." Hodie 2a vice lecta est Billa, intituled, "An Act for restraining and preventing several unwarrantable Schemes and Undertakings, in His Majesty's Colonies and Plantations in America." Preservation of the public Roads, Bill. Hodie 2a vice lecta est Billa, intituled, "An Act for the Preservation of the public Roads, in that Part of Great Britain called England." Surveying the Coasts, &c. Bill. Hodie 2a vice lecta est Billa, intituled, "An Act for surveying the Chief Ports and Head Lands, on the Coasts of Great Britain and Ireland, and the Islands and Plantations thereto belonging, in order to the more exact Determination of the Longitude and Latitude thereof." Committee on Thwaites & al. Petition revived. Ordered, That the Committee, appointed on Friday last, to consider of the Petition of Ephraim Thwaites and others, for Liberty to exhibit an Appeal from a Decree, or Order of Dismission, of the Court of Chancery in Ireland, be revived, and meet To-morrow. Whereas To-morrow is appointed, for the House to be in a Committee on the Bill, intituled, "An Act for opening a Trade to and from Persia, through Russia:"
It is Ordered, That the House be put into a Committee thereupon, on Wednesday next; and the Lords to be summoned. Whereas To-morrow also is appointed, for the House to be in a Committee upon the Bill, intituled, "An Act for the Encouragement and Increase of Seamen; and for the better and speedier Manning of His Majesty's Fleet:"
It is Ordered, That the House be put into a Committee thereupon, on Wednesday next. Dominus Cancellarius declaravit præsens Parliamentum continuandum esse usque ad et in diem Martis, septimum diem instantis Aprilis, hora undecima Auroræ, Dominis sic decernentibus. Sir Edward Bellew against Forster. The Answer of John Forster, to the Appeal of Sir Edward Bellew in the Kingdom of Ireland, was brought in. To return the Bill, intituled, "An Act to enable William Earl of Strafford, an Infant, of about the Age of Nineteen Years, to make a Settlement of his Estate, upon his Marriage with the Lady Anne Campbell;" and to acquaint this House, that they have agreed to the same, without any Amendment. To return the Bill, intituled, "An Act for establishing and confirming a Partition agreed to be made, between Henry Duke of Beaufort and William Duke of Portland, of the several Manors, Messuages, Lands, Tenements, and Hereditaments, in the Counties of Southampton and Wilts, whereof they are seised as Tenants in Common; and for settling their specific Shares and Allotments to such Uses as their undivided Moieties thereof now stand limited, and for other Purposes therein mentioned;" and to acquaint this House, that they have agreed to the same, with some Amendments, whereunto they desire their Lordships Concurrence. To return the Bill, intituled, "An Act to enable George Viscount of Garnock to sell Lands, in the Counties of Dunbarton and Air, for Payment of Debts charged thereupon; and to purchase other Lands, to be settled to the same Uses as the Estate to be sold is settled;" and to acquaint this House, that they have agreed to the same, without any Amendment. To return the Bill, intituled, "An Act for explaining and making more effectual an Act made in the Twelfth Year of the Reign of His present Majesty, intituled, "An Act for discharging Part of the settled Estate of William Earl Cowper, in the County of Hertford, from the Uses and Limitations of a former Settlement; and for settling and securing an Equivalent for the same to the like Uses;" and to acquaint this House, that they have agreed to the same, without any Amendment. 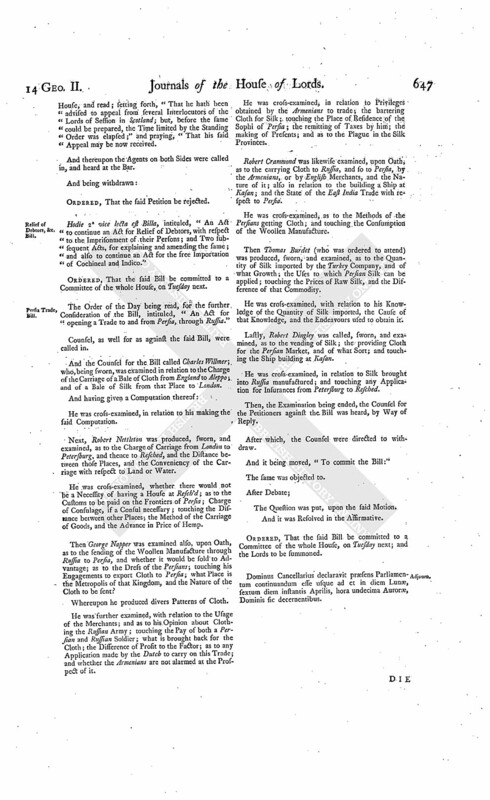 To return the Bill, intituled, "An Act for vacating a Term of One Hundred Years in a voluntary Settlement made by Sir Hugh Clopton Knight; and for creating a new Term of One Thousand Years in Lieu thereof, for the Purposes therein mentioned;" and to acquaint this House, that they have agreed to the same, with One Amendment, whereunto they desire their Lordships Concurrence. To return the Bill, intituled, "An Act for vesting Part of the Estate of Francis Pemberton Esquire, in the County of Cambridge, in Trustees, to be sold, for discharging the Encumbrances thereon; and settling another Part of his Estate to the Uses, and for the Purposes, of his Marriage Settlement;" and to acquaint this House, that they have agreed to the same, without any Amendment. 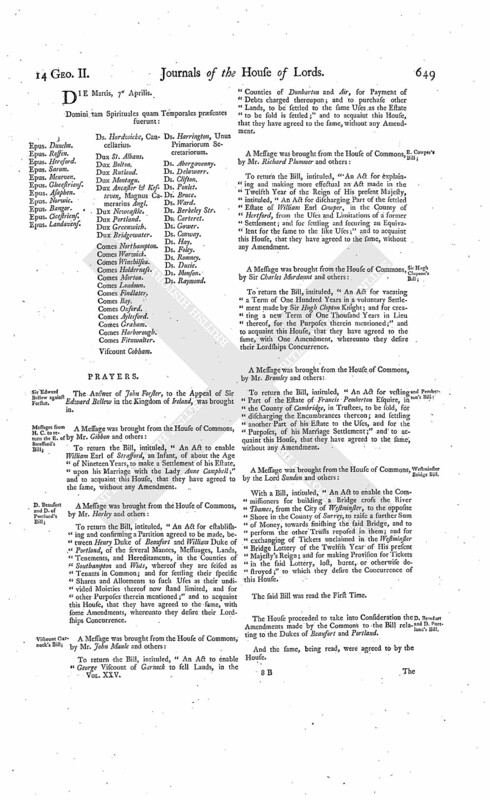 With a Bill, intituled, "An Act to enable the Commissioners for building a Bridge cross the River Thames, from the City of Westminster, to the opposite Shore in the County of Surrey, to raise a further Sum of Money, towards finishing the said Bridge, and to perform the other Trusts reposed in them; and for exchanging of Tickets unclaimed in the Westminster Bridge Lottery of the Twelfth Year of His present Majesty's Reign; and for making Provision for Tickets in the said Lottery, lost, burnt, or otherwise destroyed;" to which they desire the Concurrence of this House. D. Beaufort and D. Portland's Bill. The House proceeded to take into Consideration the Amendments made by the Commons to the Bill relating to the Dukes of Beaufort and Portland. The House also proceeded to take into Consideration the Amendment made by the Commons to the Bill concerning Sir Hugh Clopton. And the same, being likewise read, was agreed to. And Messages were severally ordered to be sent to the House of Commons, by Mr. Burroughs and Mr. Edwards, to acquaint them therewith. The Lord Harrington, by His Majesty's Command, presented to the House, Copies of several Treaties, and other Papers; with a List thereof. "Copy of a Treaty between the Emperor and King of Great Britain, signed at Vienna, the 16th of March, 1731; and of the Pragmatic Sanction annexed; with Translations thereof." "Copy of the Separate Article, for excluding from the Guaranty the Case of the Turks giving Disturbance to His Imperial and Catholic Majesty, signed at the same Place, and on the same Day; and Translation." "Copy of the Declaration concerning the Introduction of Spanish Garrisons into the fortified Places of Tuscany, Parma, and Placentia, signed likewise at the same Time; and Translation." "Copy of the Declaration concerning the Succession of Parma, signed as above; and Translation." "Copy of the Declaration, signed by the Ministers of the King of Great Britain and the Lords the States General, being provided with full Powers; and Translation." "Copy of the Separate Article, about inviting the Lords the States General to join in the abovesaid Treaty, signed also at Vienna, the 16th of March, 1731; and Translation." "Copy of the Act of Concurrence of the States General to the abovementioned Treaty of Vienna, signed at The Hague, the 20th of February, 1732, by the Ministers of the Emperor, the King of Great Britain, and the States; and Translation." "Copy of the Separate Article belonging to the said Act of Concurrence, signed at the same Place, and on the same Day; and Translation." "Copy of the Treaty between His Majesty and the King of Sweden, as Landgrave of Hesse Cassel, signed at Westminster, 9th May, 1740; and Translation." Counsel to be heard on Thwaites's Petition. 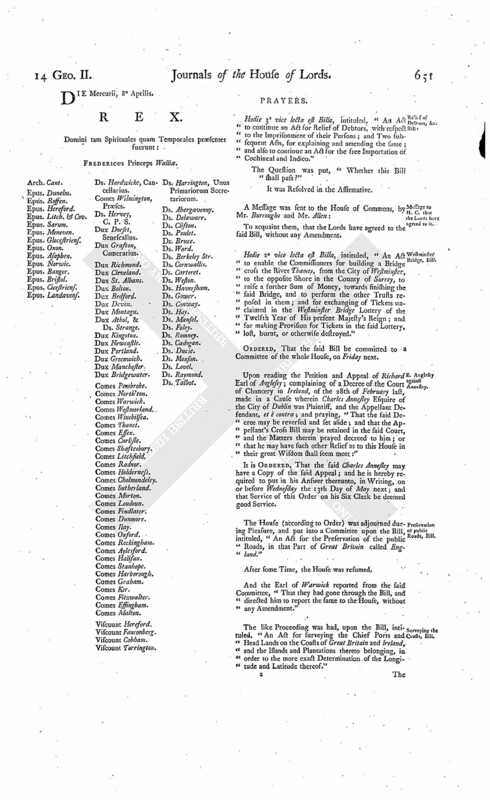 Ordered, That the Order made on Friday last, for referring to the Consideration of a Select Committee a Petition of Ephraim Thwaites and others, desiring Leave to prefer an Appeal from a Decree, or Order of Dismission of the Court of Chancery in Ireland, be discharged; and that the said Petition be taken into Consideration by this House on Monday next; and that One Counsel of a Side may be then heard, at the Bar. Ferguson et al. against Crie & al. 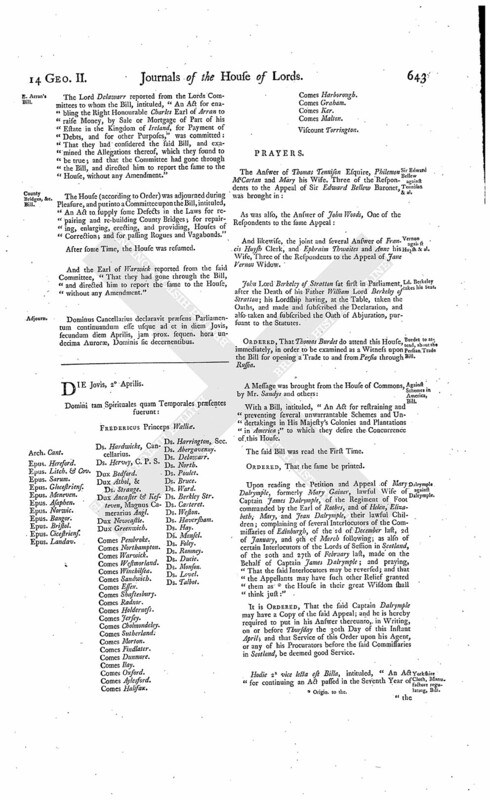 The House (according to Order) was adjourned during Pleasure, and put into a Committee upon the Bill, intituled, "An Act to continue an Act for Relief of Debtors, with respect to the Imprisonment of their Persons; and Two subsequent Acts, for explaining and amending the same; and also to continue an Act for the free Importation of Cochineal and Indico." Dominus Cancellarius declaravit presens Parliamentum continuandum esse usque ad et in diem Mercurii, octavum diem instantis Aprilis, hora undecima Auroræ, Dominis sic decernentibus. Hodie 3a vice lecta est Billa, intituled, "An Act to continue an Act for Relief of Debtors, with respect to the Imprisonment of their Persons; and Two subsequent Acts, for explaining and amending the same; and also to continue an Act for the free Importation of Cochineal and Indico." Hodie 2a vice lecta est Billa, intituled, "An Act to enable the Commissioners for building a Bridge cross the River Thames, from the City of Westminster, to the opposite Shore in the County of Surrey, to raise a further Sum of Money, towards finishing the said Bridge, and to perform the other Trusts reposed in them; and for exchanging of Tickets unclaimed in the Westminster Bridge Lottery of the Twelfth Year of His present Majesty's Reign; and for making Provision for Tickets in the said Lottery, lost, burnt, or otherwise destroyed." 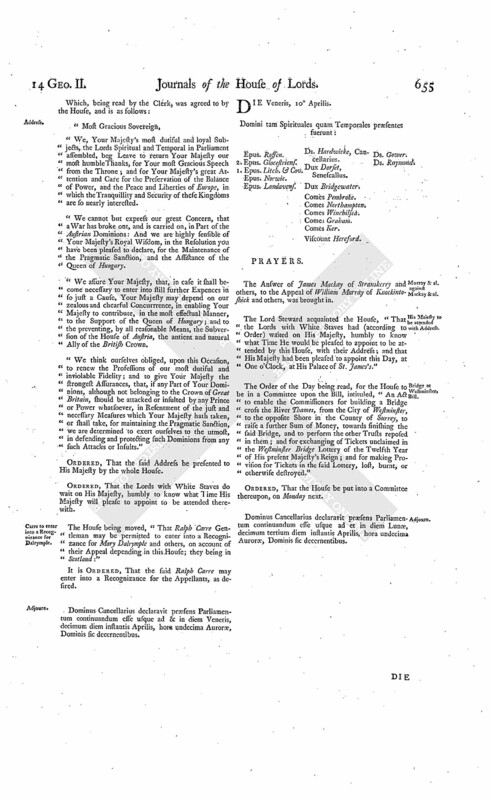 Upon reading the Petition and Appeal of Richard Earl of Anglesey; complaining of a Decree of the Court of Chancery in Ireland, of the 28th of February last, made in a Cause wherein Charles Annesley Esquire of the City of Dublin was Plaintiff, and the Appellant Defendant, et è contra; and praying, "That the said Decree may be reversed and set aside; and that the Appellant's Cross Bill may be retained in the said Court, and the Matters therein prayed decreed to him; or that he may have such other Relief as to this House in their great Wisdom shall seem meet:"
It is Ordered, That the said Charles Annesley may have a Copy of the said Appeal; and he is hereby required to put in his Answer thereunto, in Writing, on or before Wednesday the 13th Day of May next; and that Service of this Order on his Six Clerk be deemed good Service. The House (according to Order) was adjourned during Pleasure, and put into a Committee upon the Bill, intituled, "An Act for the Preservation of the public Roads, in that Part of Great Britain called England." The like Proceeding was had, upon the Bill, intituled, "An Act for surveying the Chief Ports and Head Lands on the Coasts of Great Britain and Ireland, and the Islands and Plantations thereto belonging, in order to the more exact Determination of the Longitude and Latitude thereof." His Majesty, being seated on the Throne, with the accustomed Ceremonies; the Prince of Wales, in his Robes, sitting in his Place on His Majesty's Right Hand; the Lords being also in their Robes; commanded the Gentleman Usher of the Black Rod to let the Commons know, "That it is His Majesty's Pleasure, they attend Him immediately, in this House." "1. An Act to supply some Defects in the Laws for repairing and re-building County Bridges; for repairing, enlarging, erecting, and providing, Houses of Correction; and for passing Rogues and Vagabonds." "2. An Act to continue an Act for Relief of Debtors, with respect to the Imprisonment of their Persons, and Two subsequent Acts, for explaining and amending the same; and also to continue an Act for the free Importation of Cochineal and Indico." "3. An Act for continuing an Act, passed in the Seventh Year of the Reign of His present Majesty, to explain and amend a former Act, passed in the Eleventh Year of the Reign of His late Majesty King George the First, for the better regulating the Manufacture of Cloth, in the West Riding of the County of York; and for making the said Acts more effectual." "4. 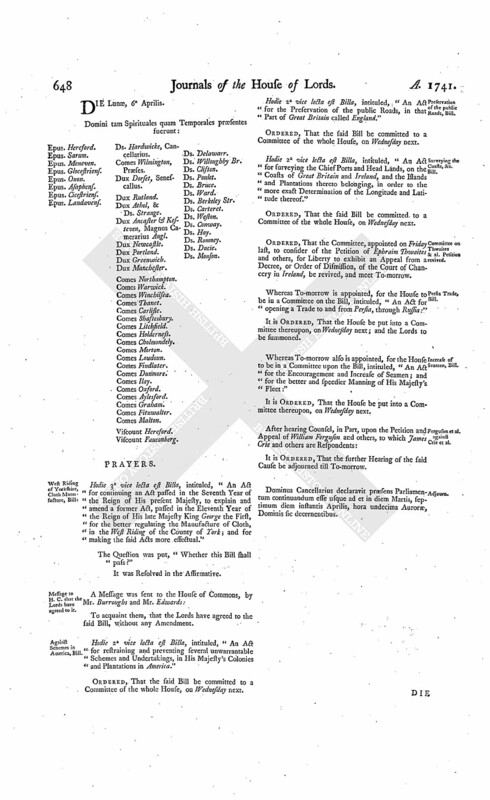 An Act for establishing and confirming a Partition agreed to be made, between Henry Duke of Beaufort and William Duke of Portland, of the several Manors, Messuages, Lands, Tenements, and Hereditaments, in the Counties of Southampton and Wilts, whereof they are seised as Tenants in Common; and for settling their specific Shares and Allotments to such Uses as their undivided Moieties thereof now stand limited; and for other Purposes therein mentioned." "5. An Act to enable William Earl of Strafford, an Infant of about the Age of Nineteen Years, to make a Settlement of his Estate, upon his Marriage with the Lady Anne Campbell." "6. An Act for explaining and making more effectual an Act made in the Twelfth Year of the Reign of His present Majesty, intituled, An Act for discharging Part of the settled Estate of William Earl Cowper, in the County of Hertford, from the Uses and Limitations of a former Settlement; and for settling and securing an Equivalent for the same, to the like Uses." "7. An Act for enabling the Right Honourable Charles Earl of Arran to raise Money, by Sale or Mortgage of Part of his Estate in the Kingdom of Ireland, for Payment of Debts, and for other Purposes." "8. An Act to enable George Viscount of Garnock to sell Lands, in the Counties of Dunbarton and Air, for Payment of Debts charged thereupon; and to purchase other Lands, to be settled to the same Uses as the Estate to be sold is settled." "9. 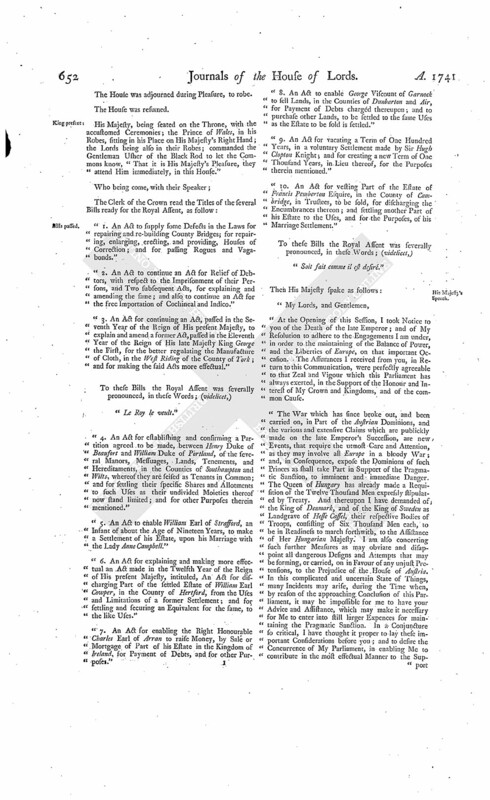 An Act for vacating a Term of One Hundred Years, in a voluntary Settlement made by Sir Hugh Clopton Knight; and for creating a new Term of One Thousand Years, in Lieu thereof, for the Purposes therein mentioned." "10. An Act for vesting Part of the Estate of Francis Pemberton Esquire, in the County of Cambridge, in Trustees, to be sold, for discharging the Encumbrances thereon; and settling another Part of his Estate to the Uses, and for the Purposes, of his Marriage Settlement." "At the Opening of this Session, I took Notice to you of the Death of the late Emperor; and of My Resolution to adhere to the Engagements I am under, in order to the maintaining of the Balance of Power, and the Liberties of Europe, on that important Occasion. The Assurances I received from you, in Return to this Communication, were perfectly agreeable to that Zeal and Vigour which this Parliament has always exerted, in the Support of the Honour and Interest of My Crown and Kingdoms, and of the common Cause. "The War which has since broke out, and been carried on, in Part of the Austrian Dominions, and the various and extensive Claims which are publickly made on the late Emperor's Succession, are new Events, that require the utmost Care and Attention, as they may involve all Europe in a bloody War; and, in Consequence, expose the Dominions of such Princes as shall take Part in Support of the Pragmatic Sanction, to imminent and immediate Danger. The Queen of Hungary has already made a Requifition of the Twelve Thousand Men expressly stipulated by Treaty. And thereupon I have demanded of the King of Denmark, and of the King of Sweden as Landgrave of Hesse Cassel, their respective Bodies of Troops, consisting of Six Thousand Men each, to be in Readiness to march forthwith, to the Assistance of Her Hungarian Majesty. I am also concerting such further Measures as may obviate and disappoint all dangerous Designs and Attempts that may be forming, or carried, on in Favour of any unjust Pretensions, to the Prejudice of the House of Austria. In this complicated and uncertain State of Things, many Incidents may arise, during the Time when, by reason of the approaching. Conclusion of this Parliament, it may be impossible for me to have your Advice and Assistance, which may make it necessary for Me to enter into still larger Expences for maintaining the Pragmatic Sanction. In a Conjuncture so critical, I have thought it proper to lay these important Considerations before you; and to desire the Concurrence of My Parliament, in enabling Me to contribute in the most effectual Manner to the Sup port of the Queen of Hungary; the preventing, by all reasonable Means, the Subversion of the House of Austria; and to the maintaining the Liberties and Balance of Power in Europe. "I must recommend it to you, to grant Me such a Supply as may be requisite for these Ends: And the just Concern and Readiness, which I have constantly found in you, to make all necessary Provisions for the public Good and our common Security, leave Me no room to doubt of the same good Disposition and Affection in this Instance. "I am persuaded, I need say no more, to recommend these Considerations to you, which so necessarily arise from the present Situation of Affairs: I shall therefore only add, that whatever Expences may be incurred on this Occasion, shall be made in as frugal a Manner as possible; and an Accompt thereof shall be laid before the next Parliament." Ordered, That the said Speech be taken into Consideration To-morrow; and the Lords to be summoned. The House (according to Order) was adjourned during Pleasure, and put into a Committee upon the Bill, intituled, "An Act for opening a Trade to and from Persia, through Russia." The House (according to Order) was adjourned during Pleasure, and put into a Committee upon the Bill, intituled, "An Act for the Encouragement and Encrease of Seamen; and for the better and speedier Manning His Majesty's Fleet." And the Earl of Warwick also reported from the said Committee, "That they had gone through the Bill, and directed him to report the same to the House, without any Amendment." Against unwarrantable Schemes in America, Bill. The like Proceeding was had, upon the Bill, intituled, An Act for restraining and preventing several unwarrantable Schemes and Undertakings, in His Majesty's Colonies and Plantations in America." Dominus Cancellarius declaravit præsens Parliamentum continuandum esse usque ad et in diem Jovis, nonum diem instantis Aprilis, hora undecima Auroræ, Dominis sic decernentibus. Ordered, That this House will hear no more Causes during this Session of Parliament. Hodie 3a vice lecta est Billa, intituled, "An Act for the Preservation of the public Roads, in that part of Great Britain called England." Hodie 3a vice lecta est Billa, intituled, "An Act for restraining and preventing several unwarrantable Schemes and Undertakings in His Majesty's Colonies and Plantations in America." Hodie 3a vice lecta est Billa, intituled, "An Act for surveying the Chief Ports and Head Lands on the Coasts of Great Britain and Ireland, and the Islands and Plantations thereto belonging, in order to the more exact Determination of the Longitude and Latitude thereof." Hodie 3a vice lecta est Billa, intituled, "An Act for the Encouragement and Increase of Seamen; and for the better and speedier Manning His Majesty's Fleet." Hodie 3a vice lecta est Billa, intituled, "An Act for opening a Trade to and from Persia, through Russia." Motion for Address on His Majesty's Speech. It was moved, "To order, That an humble Address be presented to His Majesty, to return Him the Thanks of this House, for His most Gracious Speech from the Throne; and for His great Attention and Care for the Preservation of the Balance of Power, and the Peace and Liberties of Europe, in which the Tranquillity and Security of these Kingdoms are so nearly interested. "To express our great Concern, that a War has broke out, and been carried on, in Part of the Austrian Dominions: And to acknowledge His Majesty's Royal Wisdom, in the Resolution which He has been pleased to declare, for the Maintenance of the Pragmatic Sanction, and the Assistance of the Queen of Hungary. "To assure His Majesty, That, in case it shall become necessary for Him to enter into still further Expences in so just a Cause, His Majesty may depend on the zealous and chearful Concurrence of this House, in enabling Him to contribute in the most effectual Manner to the Support of the Queen of Hungary; and to the preventing, by all reasonable Means, the Subversion of the House of Austria, the antient and natural Ally of the British Crown. "To give His Majesty the strongest and most dutiful Assurances of our inviolable Fidelity; and that, if any Part of His Dominions, although not belonging to the Crown of Great Britain, should be attacked or insulted, by any Prince or Power whatsoever, in Resentment of the just and necessary Measures which His Majesty hath taken, or shall take, for maintaining the Pragmatic Sanction, this House is determined to exert themselves to the utmost, in defending and protecting such Dominions from any such Attacks or Insults." E. Cholmondeley. L. Abp. Cant. L. B. Oxford. Ld. Delawarr. "We, Your Majesty's most dutiful and loyal Subjects, the Lords Spiritual and Temporal in Parliament assembled, beg Leave to return Your Majesty our most humble Thanks, for Your most Gracious Speech from the Throne; and for Your Majesty's great Attention and Care for the Preservation of the Balance of Power, and the Peace and Liberties of Europe, in which the Tranquillity and Security of these Kingdoms are so nearly interested. "We cannot but express our great Concern, that a War has broke out, and is carried on, in Part of the Austrian Dominions: And we are highly sensible of Your Majesty's Royal Wisdom, in the Resolution you have been pleased to declare, for the Maintenance of the Pragmatic Sanction, and the Assistance of the Queen of Hungary. "We assure Your Majesty, that, in case it shall become necessary to enter into still further Expences in so just a Cause, Your Majesty may depend on our zealous and chearful Concurrrence, in enabling Your Majesty to contribute, in the most effectual Manner, to the Support of the Queen of Hungary; and to the preventing, by all reasonable Means, the Subversion of the House of Austria, the antient and natural Ally of the British Crown. "We think ourselves obliged, upon this Occasion, to renew the Professions of our most dutiful and inviolable Fidelity; and to give Your Majesty the strongest Assurances, that, if any Part of Your Dominions, although not belonging to the Crown of Great Britain, should be attacked or insulted by any Prince or Power whatsoever, in Resentment of the just and necessary Measures which Your Majesty hath taken, or shall take, for maintaining the Pragmatic Sanction, we are determined to exert ourselves to the utmost, in defending and protecting such Dominions from any such Attacks or Insults." Ordered, That the Lords with White Staves do wait on His Majesty, humbly to know what Time His Majesty will please to appoint to be attended therewith. Carre to enter into a Recognizance for Dalrymple. The House being moved, "That Ralph Carre Gentleman may be permitted to enter into a Recognizance for Mary Dalrymple and others, on account of their Appeal depending in this House; they being in Scotland:"
Dominus Cancellarius declaravit præsens Parliamentum continuandum esse usque ad & in diem Veneris, decimum diem instantis Aprilis, hora undecima Auroræ, Dominis sic decernentibus. 1. Epus. Litch. & Cov. Murray & al. against Mackay & al. The Answer of James Mackay of Stranskerry and others, to the Appeal of William Murray of Knockintoshick and others, was brought in. The Lord Steward acquainted the House, "That the Lords with White Staves had (according to Order) waited on His Majesty, humbly to know what Time He would be pleased to appoint to be attended by this House, with their Address; and that His Majesty had been pleased to appoint this Day, at One o'Clock, at His Palace of St. James's." 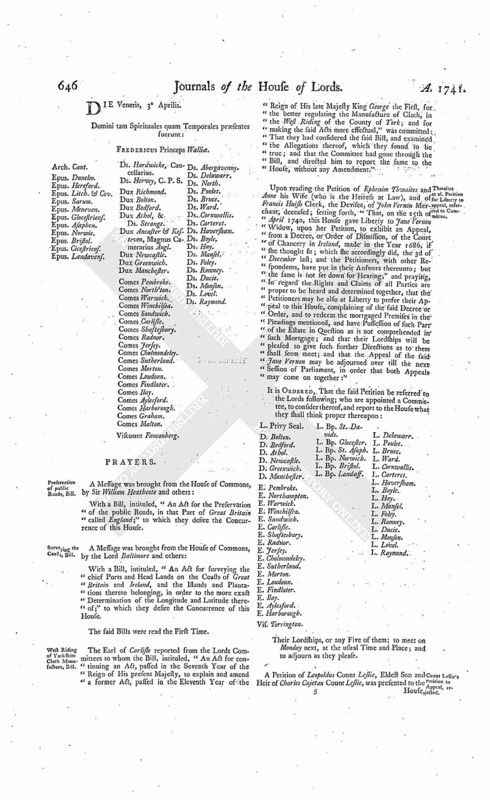 The Order of the Day being read, for the House to be in a Committee upon the Bill, intituled, "An Act to enable the Commissioners for building a Bridge cross the River Thames, from the City of Westminster, to the opposite Shore in the County of Surrey, to raise a further Sum of Money, towards finishing the said Bridge, and to perform the other Trusts reposed in them; and for exchanging of Tickets unclaimed in the Westminster Bridge Lottery of the Twelfth Year of His present Majesty's Reign; and for making Provision for Tickets in the said Lottery, lost, burnt, or otherwise destroyed." Dominus Cancellarius declaravit præsens Parliamentum continuandum esse usque ad et in diem Lunæ, decimum tertium diem instantis Aprilis, hora undecima Auroræ, Dominis sic decernentibus.